T.J. Ward, in protecting himself, ended up doing as little as possible to protect Patriots tight end Rob Gronkowski from another devastating injury. Gronkowski suffered an ACL tear on the play and is out for the rest of the season. The injury came after Ward, a safety, tackled Gronkowski low during the third quarter of the Patriots win over the Browns on Sunday. Ward said after the game that he intentionally went low on the hit, during which Gronkowski’s knee took the brunt of the blow. "I think they ran a seam route, and I closed on the pass," Ward said, according to The Boston Globe. "It was a decision I made, and just to make a tackle on a big man. Unfortunately, he got hurt, but if I would have hit him up high, there’s a chance that I would get fined and all that other stuff, so I’m just being safe." Ward’s defense is one that has been heard more and more around the NFL, as defensive players, wary of receiving penalties for hits to (or even near) the head, have gone for players’ knees instead. Those tackles don’t draw the same penalties, but bad hits to the knees can destroy players’ legs and end their careers. "It’s kind of being caught between a rock and a hard place," Ward said. "It’s a decision you have to make, but you have to follow the rules at the same time. Gronk’s a big dude. He’s not small by any means, so already, he has that height where it just makes it difficult. I made a tackle. Unfortunately, he got hurt, but if he would have got up, it would have been no discussion about this right now." 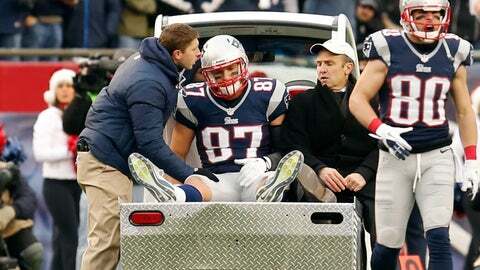 Patriots tight end Rob Gronkowski is taken off the field following his knee injury Sunday. Gronkowski, whose start to this season was already delayed by lingering back and arm injury concerns, now faces the prospect of missing a good chunk of next season, too, with ACL tears usually taking about a year of recovery time. Ward emphasized that, while he intentionally went low, he didn’t foresee the fallout from such a hit. "My intention is never to hurt anyone," Ward said. "That’s not what this game is about. That’s not how I play. I hate to see guys go down with any type of injury. I just wanted him to know, whether he accepted it or not, it wasn’t an intentional hit to injure him, but we have to play this game. We have to play it the way that they force us to, and unfortunately, it incurred an injury for him."